In 2015, some friends and I made plans to spend a weekend in Long Island. Enjoy some sand and surf, maybe cook up some dogs on the grill. Who knows. Sky was the limit. I rented a car to drive us all out there, but got locked in the garage where the rental car was supposed to be. This is my story. KELLY STOUT: Remember the time I got locked in a rental car garage? MARK, KELLY’S FIANCE: Oh yeah, that was terrible. KELLY: I remember it was a Friday night and we’d made plans to leave directly after work to beat the traffic, so everyone was kind of counting on me to pick up the rental car quickly so we could get on the road. Emily, is that how you remember it? EMILY, KELLY’S FRIEND: Sorry, what is this for? KELLY: My oral history of the time I got stuck in a rental car garage. MARTIN, KELLY’S OTHER FRIEND: Oh god, yeah, how could we forget? That was one of the defining moments of your relationship with rental car companies. KELLY: Martin, yeah! It’s funny to think about it now, but it totally was. That was one of the defining moments of your relationship with rental car companies. MARK: Kelly, what happened when you showed up to get the car? KELLY: Well, it was supposed to be in a garage in Crown Heights, pretty near our apartment. I had a code to get into the garage that I’d written down on a piece of paper—or maybe it was my phone. MARK: You had an email with the code. KELLY: Right, right. But when I got to the garage and typed in the code, it didn’t work. I had to call the rental car company—my heart really sank at that moment because I don’t believe in calling customer service unless it’s really a true emergency. So I was weighing whether this counted. I decided that yeah, this counted as an emergency. The sun was setting, and we were kind of missing the window when our head start could count as “early.” Plus, I was thinking about Rosie. ROSIE, KELLY’S DOG: I don’t like to travel at night. Typically, that’s when I sleep. KELLY: Yeah—and Rosie, that’s fair. MARTIN: I remember that was around the time you called and said you were going to be late. KELLY: But looking back on it, crazy to think that my journey had barely begun! You had an email with the code. CAR RENTAL COMPANY REP: That was when you called me and I gave you a new code. This happens sometimes; garages switch codes for security. No big deal. MARK: A red Honda sedan? KELLY: Yeah, a red Honda sedan. Well, it wasn’t there. I remember that the spots were marked with letters, but we’d be told when making the reservation that the spots were going to be labeled with numbers. I had an instinct to call back my friend from the rental car company, but when I looked at my phone, I had no service. MARTIN: Was that when you realized you were in trouble? VAN IN THE GARAGE: It was certainly when I knew. You had this look on your face like you just didn’t know how to navigate the world if your phone wasn’t working. CAR RENTAL COMPANY REP: Sometimes I think millennials are facing a real crisis of addiction to their phones. KELLY: Martin, to answer your question, no, I didn’t really think I was in trouble yet. I was feeling a little frustration, but I figured I was just in the wrong place, so I turned around and tried to exit the garage. I couldn’t. VAN IN THE GARAGE: I remember watching Kelly hunt around for an exit and she could only find the weight-triggered exit. I go through it every day successfully, but I weigh 4,089 pounds. KELLY: I kept waving my arms around thinking it was motion-activated. VAN IN THE GARAGE: It’s not. GARAGE WEIGHT-SENSOR: This was sort of on me. The issue was that when Kelly was standing on me, I could barely register her weight. KELLY: It brought us closer together, but I was so mad at you at the time. I said some things I didn’t mean. I kept waving my arms around thinking it was motion-activated. GARAGE WEIGHT-SENSOR: Oh, please, don’t worry. MARK: This was around the time I started to worry a little about you, Kelly. ROSIE: Me too. Plus, I was really hungry. MARK: Yeah, you’re never supposed to feed a dog before a road trip because they’ll get motion sickness and barf it up, so Rosie hadn’t had dinner. EMMA, KELLY’S OTHER FRIEND: Neither had we! I remember this was around the time I started texting you guys trying to find out what your ETA was. I was already out at the house, and was starting to think about dinner. I was trying to get a read on whether we should get barbecue from the place down the road or if I should attempt to cook something. MARTIN: What did we decide, in the end? EMMA: We got barbecue, which was the right choice for a lot of reasons. You guys were definitely running late, Kelly was MIA, and it was nice that we had leftovers to pick at for the rest of the weekend. KELLY: Oh yeah. Brisket burnt ends really keep overnight and are a surprisingly good breakfast. MARTIN: Why are you surprised by that? It’s a breakfast classic! MARTIN: I dunno. I think you can eat brisket pretty much any time of day. EMILY: Does that make it a “classic” though? We got barbecue, which was the right choice for a lot of reasons. EMMA: Let’s focus on Kelly. KELLY: Yes, I’m always saying that. EMMA: At that point, what was going through your mind? 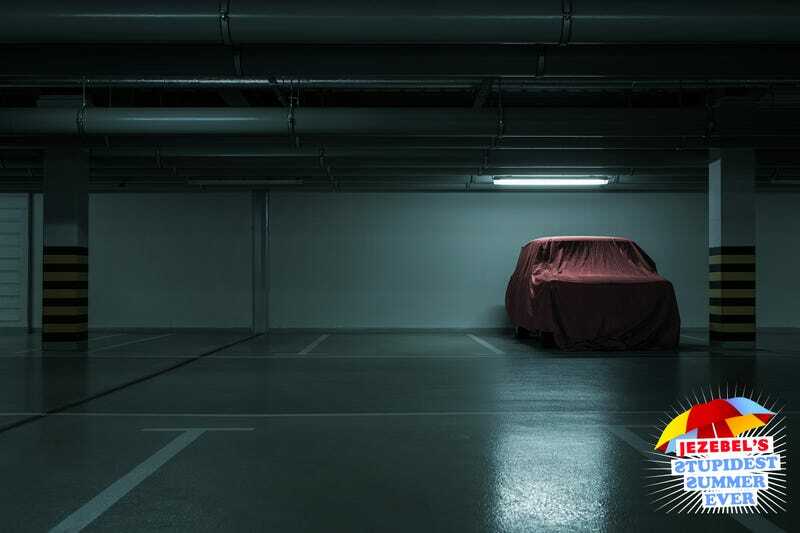 KELLY: It was dawning on me that I was locked in a poorly-ventilated rental car garage and that my death by carbon monoxide poisoning was probably on its way. I had no way to contact my loved ones to tell them how much I loved them, or that my dinner vote was for barbecue. I was starting to feel panicked. VAN: That was obvious. I think you cried? KELLY: Yeah, I cried. There just didn’t seem to be any exit other than the one that required the weight of a car to activate. RENTAL CAR COMPANY REP: There’s an emergency exit on the side of the garage. RENTAL CAR COMPANY REP: Was it really? That seems like kind of a liability. KELLY: This is what I’m freaking saying! MARK: I finally decided to feed Rosie because it was getting so late. ROSIE: It was so good. I ate crunchies with wet food on top. MARK: I remember the crunchies—but was there wet food? KELLY: I remember going kind of in and out of being rational. I knew that eventually someone would find me, but the question was sort of in what state I’d be found. How long would it take to send out a search party, etc. EMILY: Kelly! We were already worried! I was starting to think something bad had happened. We wouldn’t have just forgotten you. KELLY: Of course I know that now, but at the time I was worried. EMMA: I wasn’t that worried until Martin texted me that you hadn’t come back from the rental car garage. KELLY: Yeah, they’re pretty scary. EMILY: How did you finally get out? KELLY: Finally, another car entered the garage. Someone returning their rental. I scurried out. I felt relief, but also, I had nowhere near the number of panicked texts about my whereabouts I had expected, and we still didn’t have the rental car. I wasn’t that worried until Martin texted me that you hadn’t come back from the rental car garage. VAN: I was sort of sad to see you go. Watching you panic had been sort of a highlight of my night. RENTAL CAR COMPANY REP: That was when you called me again. I remember being disappointed to hear from you, since I thought we’d already solved your issue. KELLY: No. It had barely begun. I remember telling you my whole saga, and you said that it was probably just that the last person who used the car had parked it outside the garage because they’d had the same code problem. RENTAL CAR COMPANY REP: Yeah, that’s common. I remember that the car ended up being around the corner. KELLY: Yeah, or maybe down the street. MARK: I remember you located the car and were so psyched. You called us with the good news, and I was so happy! But because our departure was pretty imminent, I was sort of regretting feeding Rosie. KELLY: So then I picked you guys up at our place. MARTIN: It was almost 10pm at that point so we were all pretty hungry and cranky. ROSIE: I was annoyed that we had to travel at night, since I prefer to travel during the day. KELLY: Crazy that I almost died that night.